Do people get lost at Vaishno Devi? I looked up and down the street, frantically searching for a known face. Hordes of people chanting ‘Jai Mata Di’ kept going in both directions, each time reminding me of the old song on Doordarshan I had heard as a child. The old and disabled were on shoulder carry chairs, the young and non-walkers on horses and the majority on feet. Even at this time of the night, way past midnight, there was no change in the number of devotees taking the 12-km walk up or downhill the Vaishnodevi shrine. As far as my perfectly normal eyes could see, I couldn’t find my family anywhere. 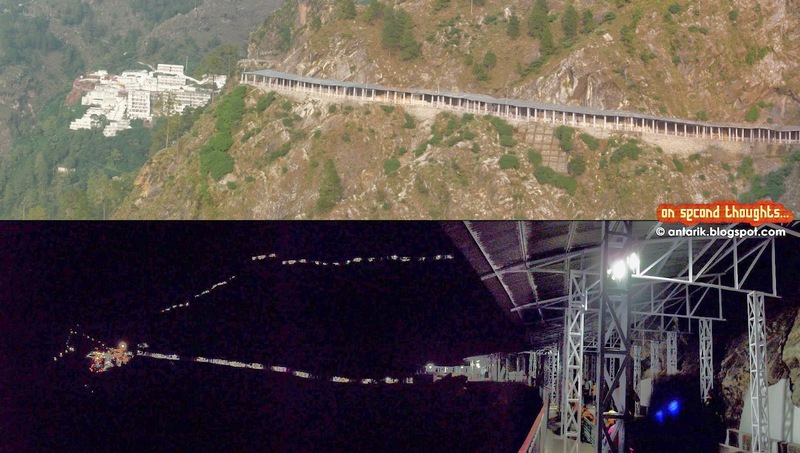 Day and Night time view of the walking path to the Vaishno Devi shrine at Katra, Jammu, India. I checked my phone. There was no network coverage. It was almost 1 o’clock, 40 minutes since what I now realized, was a situation where I was ‘lost’. I sat down quietly at the bench on the side of the road, just across the flight of stairs I had just climbed down, and started recalling each step I had taken in these 40 minutes, right from the moment I last saw my parents and younger sister. “Mom, I am climbing down these stairs. The signboard says it is just 90 steps,” I had told my mother excitedly. “Okay, but don’t go very fast. You might get lost,” she instructed me. “I am a big boy Mom. And this is the year 2011. I have a phone with me, and so do you. Do you think it is possible to get lost even if I try?” I joked. She didn’t protest further. I knew my parents were tired of the walking. They had walked uphill 12 kms and now were mid-way downhill. But my 19 year old self’s excitement was intact. Unlike my parents who were here for the darshan, I had been more excited for the 12 km walk up and down the hill and the crawling through the shrine’s old cave. The cave was now closed to visitors and it had been a disappointment for me. I would be happy and feel accomplished only after the entire downhill journey ends. My ‘adventure’ quotient was much higher than the ‘religious’ one. I ran down the flight of stairs. The narrow and steep set of stairs wasn’t very easy to descend. Added to it the time of the night and the dark shadows caused by the shrubs and trees on both sides of the railings with the rare but sudden gushes of wind, an area of uneven lighting could be dangerous if each step is not carefully trodden. “68… 69… 70… 71…,” I continued counting the stairs. When about 15 steps were left, I sat down and looked upstairs. I couldn’t see my parents due to the curve in the staircase. . Climbing down these steep stairs wouldn’t be so easy for them, I thought. They would soon be here. As a couple of minutes passed, I saw my family emerge from the bend. “Are you tired?” my mother asked me on seeing me sit down. “A little. But you carry on. I will join you very fast,” I replied smiling. “Okay, see us at the bottom of the staircase,” she replied as the three of them carried on with the climb-down. I saw them take another bend through the stairs and waited for a couple of minutes before starting my fast run down the difficult stairs. Aah…I need to be a little careful, I thought. I reached the bottom of the staircase. It opened into a crossroad with a few shops lined up in the uphill direction and loads of devotees walking up and down. There were a couple of benches on both sides of the road, beside the staircase and across it. I quickly looked for my family. Mom said she would wait here for me, where is she? Where are all of them? I wondered. I spotted a signpost directing towards the nearest washrooms. It was about 30 feet away. That’s where they must be, I thought and smiled. I sat down across the washroom and waited. Ten minutes passed. So many people had gone inside the washrooms and were back within a couple of minutes. But my parents or sister weren’t out yet. I went inside the men’s room. It was occupied by just a couple of men. And neither of them was my father. I started getting a little worried. I rushed out and made an enquiry about the women’s room from the attendant who went inside to check and returned with a negative answer to my search query. Probably this means they didn’t come to the washroom at all! I ran back to the stairs I had just climbed down and looked around the entire place. The road was flooded with tourists and devotees. None of them were my family. I started getting nervous now. I took out my phone but realized the device was useless. There was no network coverage here for my prepaid sim. I checked the time, it was half past midnight. I rushed to the nearby shop and enquired about the nearest telephone booth. If I could reach a phone booth, I could call up my father whose was the only functioning phone right now. “Walk down the road for about 100 metres and take the stairs down. Midway through the stairs, there is a phone booth,” the old man at the shop told me. I thanked him for the information and after another careful glance around the whole area, rushed to the stairs as instructed. The board reads: Shri Mata Vaishnodevi Board. Please pay attention: These stairs number 526. Heart patients and senior citizens are requested not to use these stairs. 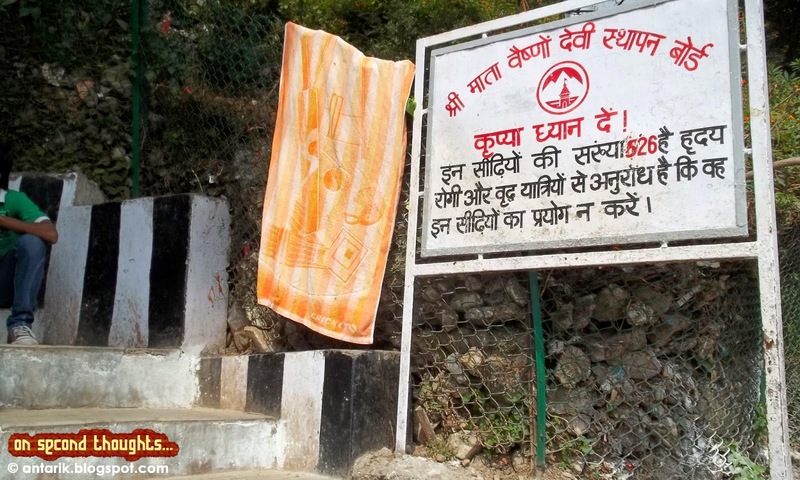 Similar boards can be spotted on the 12.5 kilometre walk up the hill to the Vaishno Devi temple at Katra, Jammu, India. I spotted the stairs. The signboard said they were more than 400 in number. I gulped at the huge number. This would be the only way to find them, I thought. I started climbing down the stairs keeping a count of the number of stairs I had covered. As I reached around 250 steps, I didn’t see any sign of a shop anywhere. This particular set of stairs was also very dimly lit, almost dark at some places. There were hardly any people who were on this stretch. I started getting worried. Did the shopkeeper lie? Could this be some kind of trap? I couldn’t stop my mind from wandering around. Recollecting all the detective stories that I had read didn’t seem a very good idea just then. I started praying: Less for my finding the phone booth and more for finding the booth without encountering any other unexpected and unwanted people or situation. I continued down the stairs. Obviously descending was the only option I had. After more than 12 hours of walking, I didn’t have any strength left to climb 250 odd and steep stairs back. As I spotted a ray of bright light coming from a corner, I felt relieved. I went further down. Yes, here were some souvenir shops in the middle of the long staircase. But where was the phone booth? I enquired at the nearest shop. The kind shopkeeper offered the phone in my shop for the call. I dialed my father’s number. The call didn’t connect. I tried again. The number you are trying to reach is currently switched off, came the astonishingly sweet lady’s recorded voice. I tried again. Same response. And then it hit me. Of course, the phone would be off. It had run out of battery just a few minutes ago and my father was going to use his sim card in my phone in case it was required. Nobody had given a thought that it would be required so soon! I made one last attempt at calling my father’s number. The same response. I put down the receiver, thanked the shopkeeper and turned away. What should I do now? What options do I have? Should I go up or down? Nobody would find me here unless they take this particular set of stairs! What should I do? He thought. May be I could go to the end of these stairs and wait there. The road meets there as well. My parents would either take the stairs or the road to get down, there is no other way. So they are bound to meet me there! Absent minded I started walking down the stairs. No more running. No longer excited. A big group of people clad in saffron passed across me shouting the ‘Jai Mata Di’ chants and I was brought back to the present. I had recounted each bit in detail. Where could my family vanish? How did I not see my mother at the end of the staircase as she had promised? Why would they leave me alone in this unknown place? Millions of thoughts raced in my mind. Thousands of possibilities arose. Are they safe? Could something have happened to them somewhere? And possibly they were taken for a medical emergency? I looked around the place. I could hear continuous announcements on the public address system. I went up to a nearby policeman and enquired about the nearest place where he could get an announcement made. “The announcement booth is right at the bottom of the hill at the entrance. And there is one at the temple on top,” the policeman replied in a matter-of-fact voice. “Top and bottom? I am right in the middle. Both of them are at least 6 kms away!” I said angrily. “Don’t worry. This is not Kumbh Mela. Nobody ever gets lost at Vaishno Devi. Wait here or go down the hill and wait for your family at the entrance. You are bound to find them soon,” said the policeman. I turned away without uttering another word. How could the policemen be so casual? I thought. I paced 10 metres up and down the street, not daring to go anywhere and not losing my sight from the staircase. I kept looking for a woman in a blue salwar suit, a man in a brown sweater with a little girl. They would be here any moment now, I thought to myself. A sudden gust of wind made me realize the chill in the October night air. I didn’t put my sweatshirt on. My parents knew what I was wearing when they saw me last- a blue shirt and jeans. If it stays that way, may be some way it would help. I nervously kept checking my phone as if some miracle would happen and my father would call me from somewhere. Nothing of the sort happened. It was quarter past one now. I stood on the bench. Looking as far as I could. No sight that could cheer me up met my eyes. Another big group of tourists came downhill from the road and were crossing me. I looked for any known face in the crowd. No one. Suddenly a man came towards me. I clearly remembered seeing the face when they were up at the temple and waiting in the queue few hours ago. “Are you looking for your father, mother and sister?” he asked me. “Just walk up this road about half a kilometer and you should find them,” he told me and smiled. “Thank you thank you,” I said and rushed uphills, not giving another thought to the man, nor noticing how he vanished into the crowd. As I walked up, half-running at times, I sensed my tired legs. There was a sudden rush of energy in me and I kept walking, looking around at all the people coming towards me after their holy darshan, searching for a known face. The day’s long walk had allowed me to calculate the distance with my footstep size. Two big footsteps for one meter. I kept a count on the distance. I was nearing half a kilometer when I heard a shout. “Mom, see there. That’s brother,” came the girl’s broken voice. I looked up surprised. My parents and sister were standing there in a corner, evidently crying. I had been successful in finding the known faces in the unknown crowd. I ran towards them. All three of them hugged me tightly and kept crying. I didn’t understand. Even in this most-modern world, all means of communication had failed and had separated me from my family for one and a half hours. A strange man had told me where I would find my family and I had found them exactly there. And now everyone was crying on my shoulders. “Where were you when you said you would wait for me at the end of the stairs?” I asked my mother. “We were waiting right there for you. You never showed up. Dad could hardly walk but he went back up the stairs to find you, you were nowhere in sight,” my mother cried. “But I came down immediately after you. And couldn’t see you anywhere!” I exclaimed. “How is it possible? We were there. At the bottom of the stairs. We waited there for more than half an hour before Dad went uphill to look for you,” my mother said. “How did you find us?” my sister asked me. “A man told me by the clothing description,” I replied. “Yes, there was this man who asked us when he saw mom-dad crying here. So we gave him your description. He said he probably had seen you and so went downhill to find you and tell you about where we were,” she replied. “Okay, but I think I saw him earlier inside the temple,” I said. “Because when he approached us he was on his way to the temple and not coming from there. And because he had probably seen you, he went down to inform you,” she told me. I was confused, but didn’t reply. My parents were still crying and hugging me. In that moment, probably I did understand the emotions of my father, mother and sister; the strong bonds of a family. Probably I did understand that I couldn’t rely on technology and that there was a power stronger than science that could easily make every possible communication tool useless. Probably I started believing in this supreme power. But a few questions did strike me again and again for which I have found no answer- How could I not see my family at the bottom of the stairs if they were there? Who was that known face in the crowd? I have never been to Vaishno Devi. Want to go there more after reading this. Roughly, what was your total expenditure? including everything. We actually took the IRCTC package from New Delhi. And the trip was in October 2011. You can check the packages at http://www.railtourismindia.com/ It was a really good package with a stay at the Country Inn Resort in Katra. But I am sure, a non-package trip would be much cheaper. Time and again, i keep looking for the answers but am left only with the questions! You made me cry again recollecting the old memory. I am reminded that I have to make another trip to the shrine. I am still thinking of that man. Was he sent by the Mother Vaishnodevi to help us when we lost all hope of seeing you again? Certain mysteries remain unsolved and defy all human understanding. I originally wrote this in third person but when my classmates heard it, it was suggested I should convert it to first person. They didn't know until then that it was a real story and was meant to be in first person.